In similar form to solutions we've seen from Nyko, Energizer has announced Power & Play recharging kits for the Wii, Xbox 360 and PS3. 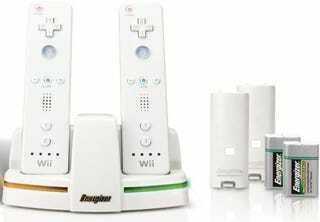 The Wii system (pictured) runs $40 and includes batteries and replacement doors for two Wiimotes. The 360 and PS3 Power & Play aren't quite the same bargain, consisting only of a recharging base for $30, but hey, Microsoft and Sony have already provided fairly elegant battery solutions for gamers. Read on for full details. Household Gamers: Keep the Remotes Handy and Ready to Go with Energizer(R) Power & Play Charging Systems While disposable batteries are an appropriate solution for many gamers and households, some - especially heavy battery users - prefer to rely on a rechargeable option. That's why - for active gamers - Energizer is now offering Energizer(R) Power & Play charging systems designed specifically for Wii(R) by Nintendo(R), Microsoft(R) XBox 360(R) and Sony(R) PlayStation 3(R) wireless controllers. The Energizer(R) Power & Play charging system for Wii(R) by Nintendo(R) remotes, which retails for a suggested price of $39.99, comes with rechargeable batteries, replacement battery doors and a charging station. Replacement rechargeable batteries and covers are also available for $10.99. The rechargeable battery pack for the Wii(R) Fit by Nintendo(R) is equipped with an audible and LED low-battery indicator and has a suggested retail price of $29.99. The Energizer(R) Power & Play charging systems for the Microsoft(R) XBox 360(R) and the Sony PlayStation 3(R) include a charging cradle and A/C powercord and have a suggested retail price of $29.99. Additional charging cables are available for $12.99 for the XBox 360(R) and $9.99 for the PlayStation 3(R). Sleek, convenient and easy to use, all of the new Energizer(R) Power & Play charging systems will be available in stores this month, just in time for the busy holiday season. Created through a licensing agreement with Performance Designed Products (PDP), the new Energizer(R) Power & Play charging systems mark the first time that Energizer has partnered with a manufacturer in the gaming arena. "With the popularity of gaming, we wanted to give gamers two viable solutions to power their favorite wireless controllers," said Laakko. "Whether using Energizer(R) Advanced Lithium or our new Energizer(R) Power & Play gaming charging systems, gamers using Energizer products can rest assured that their fun will last and last."